Ongoing research has associated high intake of both soluble and insoluble fibre from a variety of whole foods with reduced risk of a wide variety of health-challenging conditions. GNLD’s Multi-Fibre Blend provides a convenient way to boost dietary intake of fibre from 16 different whole-food sources. Fibre from 16 whole-food sources. Contains oat fibre, soy fibre, citrus fibre, pea fibre, oat bran, beet fibre, soy bran, lemon pectin, fig powder, apple powder, banana powder, almond meal, prune powder, orange fibre, apple fibre, acerola fibre, peanut flour, carrot fibre, and sun choke (Jerusalem artichoke) flour. Concentrated. 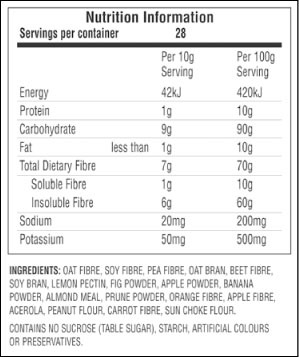 Each serving of Multi-Fibre Blend contains seven grams of dietary fibre - one quarter of the Daily Value. 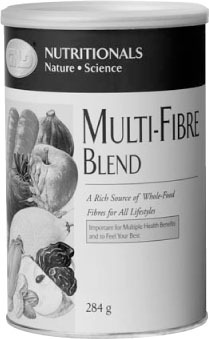 What’s more, Multi-Fibre Blend is low in fat, sodium, and calories, and contains no cholesterol. Counters the detrimental effects of modern, processed foodstuffs. Contains no sucrose, artificial colours, flavours or preservatives. Low in fat, kilojoules and sodium. Also delicious in GNLD’s Nutrishake and Protein Powder.